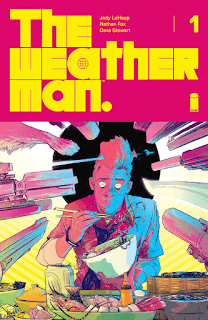 The Fellowship was fortunate enough to obtain a copy of THE WEATHERMAN #1 from Image Comics. Jody LeHeup writes, Nathan Fox draws, Dave Stewart colors, and Steve Wands letters. Nathan Bright is by far the most popular weatherman on Mars. He’s a bit of a party animal, he has a hard time getting to work on time, and he loves his dog. People love him, though, maybe because of the craziness. It’s distracting, and people on Mars need to be distracted from reality after the disaster seven years ago. But it appears that Nathan is the center of something really big. Big enough for someone to want him dead. This first issue does a wonderful job of letting us get to know Nate. We get to see him in a string of different emotional states, and that takes some really clever writing. It also sets us up brilliantly for the final page, which I wouldn’t spoil for the world. We also get some great background work here, which helps with the worldbuilding, and some fabulous coloring to go with it. Who is Nathan Bright? And why do we care? You’ll be dying to know after you read this comic. Trust me. THE WEATHERMAN #1 is available now from your local comic shop, or online at imagecomics.com.